Alec Issigonis in 1959 and greeted with amazement by the public. Much smaller wheels than those previously seen and an overall utility look with sliding windows and a sash-pull for opening the doors did not deter the buyers who saw the mini as an accessible small car. 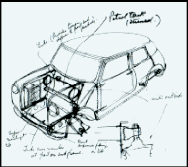 By the end of production nearly 5.5 million minis had been sold making the design the most popular British model. Besides being a popular car with family and other motorists the design had also won the Monte Carlo rally three times. 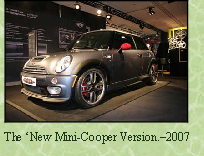 (Mini-Cooper) In an international poll to find the most influential car designs ever – the mini was second to the legendary Model-T Ford. At the end of its production run in 2000 a newer variant appeared – the New Mini and so the innovative design lives on in a redeveloped form. 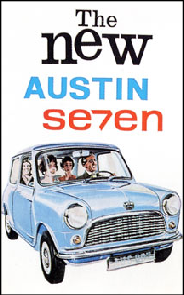 Long gone now though are the cord-pull door handles, the bare interior parcel shelf and the sliding windows – all features of the original design and which very soon disappeared as the car gained a significant market share of the 1960s. That austerity look that kept the price of the car so much lower than other models and which brought motoring to a wide market are no longer features that draw customers in the car market. 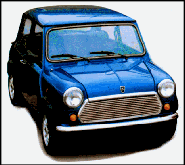 In 1967 Issigonis expanded the idea of the mini into a slightly larger design – the ‘Mini Metro’. This design finished its production run in 1998.
a reduction in length was achieved which in a car designed for city travel – parking being a priority – was essential. Parking being rated a priority in the less populated roads of 1960 now seems vaguely amusing ! admiration to the extreme. 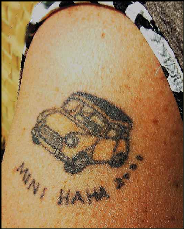 A tattoo that depicts an early mini clearly shows an original fan. So now estimate the age of the woman whose picture is featured here ! It might perhaps be difficult for her to against the idea that it wasn’t the latest model that was used as a reference at the time ! wheels could withstand rotation speeds required –since they were so much smaller than those on more conventional cars of the period.